Some people will buy this device, some people won’t. I won’t comment on the market viability of the product – time will be the judge of that. I’m quite looking forward to being able to buy one. In reading some of the comments from various people, I’m very struck by the number of people that say things like “you can’t even download a text file in Safari and open it up in another app…” or “…the lack of multitasking is only one fundamental flaw that prevents it from being more useful…”. What I find interesting about these views is how completely irrelevant these use cases are for most users. I am what most people would consider an “early adopter” perhaps even a power user. I can’t remember the last time I’ve wanted to download a text file in Safari, never mind open it up in a different application that the operating system doesn’t already handle for me. Youtube videos open nicely in the Youtube app, links to maps open up nicely in the map application. You could say that Apple has perfectly anticipated what I need from Safari and made it happen. 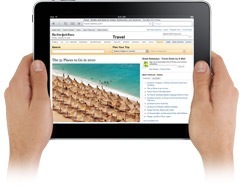 I fully expect that the iPad will be exactly the same. So, for all of you that think that the iPad will flop because “it doesn’t do x”, just remember that 99% of the population probably won’t miss “x” and will be utterly thrilled with what this neat little device *can* do. Welcome to the New Byte.org! I started blogging more than 10 years ago. Someday, I’ll tell the whole story, but the synopsis is that I first started posting status updates to a web page using handcrafted HTML sometime in 1999. At some point, I moved to UserLand Radio, then MovableType and then Blogware. I was on Blogware *forever* and recently, I’ve moved everything to WordPress, as you can see. I’ve decided to post fairly regularly about stuff that interests me. Nothing too heavy, just riff-raff that I need to get out of my head. I love your comments, so please be sure to take a load of on me anytime you want.